One of the great mysteries in biology is how the many different cell types that make up our bodies are derived from a single cell and from one DNA sequence, or genome. We have learned a lot from studying the human genome, but have only partially unveiled the processes underlying cell determination. The identity of each cell type is largely defined by an instructive layer of molecular annotations on top of the genome – the epigenome – which acts as a blueprint unique to each cell type and developmental stage. The latest study from Christoph Bock’s team charts the epigenetic landscape of DNA methylation in human blood. Led by CeMM scientists Matthias Farlik and Florian Halbritter together with Fabian Müller from Max Plank Institute for Informatics, this study highlights the dynamic nature of the epigenome in the development of human blood. Our body produces billions of blood cells every day, which develop from a few thousand stem cells at the top of a complex hierarchy of blood cells. 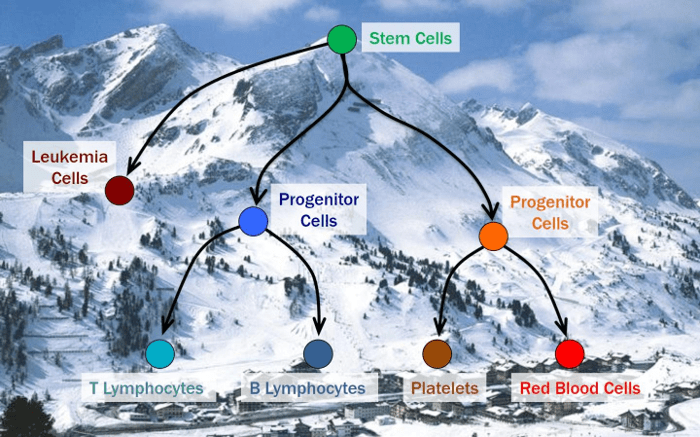 Using the latest sequencing and epigenome mapping technology, Bock’s team now unraveled a blueprint of blood development that is encoded in the DNA methylation patterns of blood stem cells and their differentiating progeny. The result of the combined effort of Bock’s team and many other members of IHEC is a detailed map of the human epigenome, similar to a three-dimensional mountain landscape: The stem cells reside on the mountain top, with valleys of cellular differentiation descending in many directions. As the cells differentiate, they pick one of several epigenetically defined routes and follow it downhill, eventually arriving at one specific valley, corresponding to a specialized cell type. Cells cannot easily escape these valleys, which provides robustness and protection against diseases such cancer. Two other studies by Christoph Bock’s team were published earlier this year and showcase how researchers are seeking to utilize epigenetic information for medicine. For instance, certain routes of differentiation are jammed in leukemia, such that cells can no longer reach their destination and take wrong turns instead. Surveillance of those cells by epigenetic tests can contribute to a more precise diagnosis of leukemia – clinical tests of this approach are ongoing. „The epigenetic map of the human blood helps us understand how leukemia develops and which cells drive the disease” says Christoph Bock. This is relevant to cancer diagnostics and personalized medicine, and it provides a compass for future efforts aiming to reprogram the epigenome of individual cells, for example by erasing critical epigenetic alterations from leukemia cells. “The collection of manuscripts released by IHEC impressively demonstrates how epigenetic information and analyses can help find answers to pressing questions related to the cellular mechanisms associated with complex human diseases”, said Professor Hendrik (Henk) Stunnenberg from Radboud University, The Netherlands, former Chair of the IHEC International Scientific Steering Committee and coordinator of the EU-funded BLUEPRINT project.